I’m wolf-looking only more like a werewolf with brown and black coloring. I wear studded leather armor with my ankh out and showing against my armor, with a scar across my muzzle. Gold eyes if that makes a difference, and as far as hair length I’m a wolfen. Birthday 9-12-84 (age 24)	 Save vs poss. Reputation 7 Save vs. m.c. When wielded by a Priest of Light, such as Greldarr it does 4D6 damage, but double damage to any Gods or minions of the Pantheon of Taut (the dark religion). It adds 5% to all prayers, blessings, etc. It also has the power to remove curses at 50%, but cannot be used on the same person more than once. Also, Greldarr's height and strength allows him to wield this 2-handed sword with only 1 hand. Inventory: Set of traveling clothes, traveling cloak w/hood, ceremonial robe, winter traveling clothes, boots, belt, bedroll, backpack, large satchel, 4 small sacks, water skin, 1 small ankh, 1 small set of scales (symbol of Osiris), a large silver ankh, 4 wooden spikes, small mallet, 30’ rope, 3 vials of holy water, silver chalice, small mirror, tinder box, 5 days of food rations. 4 Pairs of Socks, 2 Wool Shirts, 4 Pants, 2 Vests, 1 Heavy Jacket, 1 Fur Jacket, 1 Leather Large Brim Hat, 1 Belt, 1 Sword Belt, 1 Sword Sheath, 1 Knife Sheath, 1 Hooded Robe, 1 Light Robe, 20 Iron Spikes, 1 Oil Lantern (12 hours/2 pints), 10 Pints of oil in individual flasks, 12 sticks of chalk, 12 sticks of Charcoal, 2 Etching Needles, 1 Etching Plate, 4 lbs Jars of Fruit, 4 lbs Jars of Vegetables, 4 lbs Jerked Beef, 2 lbs Fine Salt, 2 Pints of Honey. White robe with gold woven lettering “Greldarr” above “CrIsis” at chest. Map of Dragon’s Claw region. Bracelet of Beads of Soul- 6 beads that are PPE batteries 30PPE each. Alchemist states that they must be recharged within 48 hrs or they go dead., Scroll Carpet of Adhesion (2nd), 1 Scroll Fog of Fear (2nd), 1 Scroll See the Invisible (2nd), 1 Scroll Wisp of Confusion (2nd), Commune with Spirits (3rd), 1 Scroll Part Water (5th). 1 scroll each of the following, all at 6th level: Tongue of Understanding, Lungs of Wind, Leg of Retribution, Eye of Sight, and Kidney of Safety. In Pack: ceremonial robe, boots, bedroll, backpack, large satchel, 4 small sacks, water skin, 1 ankh, 1 small set of scales, 4 wooden spikes, small mallet, 20 iron spikes, 30’ rope, 3 vials of holy water, silver chalice, small mirror, tinder box, 14 days of food rations. 4 Pairs of Socks, 1 Knife Sheath, 1 Hooded Robe, 1 Light Robe, 1 Oil Lantern (12 hours/2 pints), 10 Pints of oil in individual flasks, 12 sticks of chalk, 12 sticks of Charcoal, 2 Etching Needles, 1 Etching Plate. Shield on back. On Greldarr’s Eighteenth birthday he set forth on his quest for adulthood. He set forth into the Northern Hinterlands to find his path and his purpose. On his third day out a great and terrible storm struck. The first day of the storm wore down on him heavily and yet he shrugged it off, and bore it with strength. He figured the storm would end soon, but on the second day he became lost and unable to find his path and grew weary. He knew after that second day that he would need to seek shelter or perish. When he fell for what he thought would be his final time, weariness entering into his bones, a bright light cut through the storm and he weakly got to his feet and trudged until he came to the mouth of a cave. He entered into the light, and a very ancient-looking elf looked at him and smiled. “Ah, So you’ve finally come. Good, now I can finish what I’ve started and you can learn the path fate has set before you.” As the last word was spoken Greldarr fell to the ground and passed out. When Greldarr awoke the ancient elf stood nearby. “Ah, so you’ve awoken my friend, good. It is good that the gods have sent me one so strong. I feared for a moment there that you would die but I was granted the power to heal you.” The elf then went to a set of books upon the wall and removed one. In this book you will find the name of my successor, the one my god chose tens of thousands of year ago. Read me the name in it. Greldarr opened the book to the marked page and it was then that fear gripped his heart and awe as well. “Greldarr Fireheart” was written in the book. “Greldarr Fireheart, but that is me? How can this be? What trickery is this?” The elf smiled. “ It was written long ago by a mad scholar who foresaw what was to come.” The elf smiled, looked about, and then sat in a chair nearby. “It seems that you and I are to be teacher and student and yet I do not envy where your path will take you. I am a priest of a long-lost god and you, my friend, will be the priest that helps bring his return to the world. That is your purpose and that is your curse. So for the next few years the Wolfen learned the ways of the priest and the god Osiris and those in the pantheon of the Church of Light & Dark. When the day finally arrived that he was to leave they parted ways and Greldar headed east to learn and grow until the time that a god would call his name and set his path. The first year after leaving Surulon he spent among the Orcish people making friends and allies. Greldarr healed the sick and learned how to brew herbs and spices. He learned much that gave him strength and knowledge that he knew someday would guide him on his path. He learned about archaeology from a human that was curious about his god, saying that no priest had seen anything of Osiris in hundreds of years. They became close friends and Greldarr soon parted ways after learning much. The world looked very different to Greldarr, since he’d finished his training to be a priest of Osiris. Even though the god was killed and his pieces spread across the world there was still power left from his pantheon and from him. Not what you would think possible considering, but Greldarr had been blessed, and was the chosen of Osiris. Of course the fact he was chosen before his birth to be a Priest was a bit disconcerting. 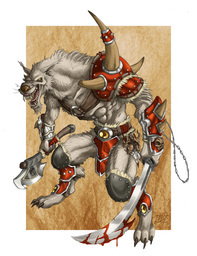 Also it was something one wouldn’t have even thought about, or considered, and him being a Wolfen too. Who would have thought that? He left his teacher in that cave all those years ago and the book he now keeps in his pack in a hard case with a water tight interior. The book represented the teachings of his god and the name of his successor and when and where he must be in order to meet him, but that would be a very long time from now indeed. Even now, years later, he wondered what his life would be like if the gods had not chosen him for their calling. 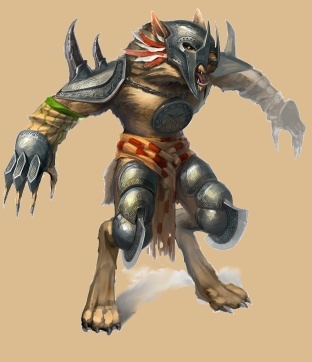 However, now he had to accompany two elite-trained goblin soldiers and his sister to the Eastern frontier where they will serve in one of the outposts to guard against the incursions of man into the Wolfen Empire. His sister would be in charge of one of the outposts and the two goblins were trained by his father to help protect her and accompany her. No one would ever suspect goblins of being good fighters but these two were more skilled then anyone could ever imagine. So he made the journey with the goblins and his sister. The journey took a month and they avoided trouble and finally arrived. Shortly after leaving his sister he started to head back home. But that night he received a vision from his god. “You must seek out the two humans from another world and a Red Dwarf with this ring.” A ring appeared in Greldarr’s hand. “Yes my lord.” And then the vision was gone. And So Greldarr set forth on his quest and where it will take him only the Gods know. Greldarr was born under the sign of Kym-nark-mar, the dragon god. This signsymbolizes magic, and those born under it tend to be naturals when it comes to magic studies. Due to this aptitude those born under this sign tend to be cocky.